Tools for the serious griller. 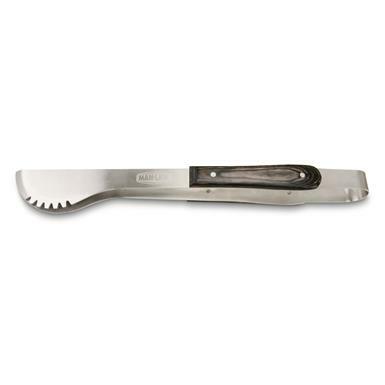 Grilling fish, fowl or steak is a serious endeavor requiring serious tools. These MAN LAW® Tongs are up to the task. Seriously strong 2.5mm stainless steel construction and long-reaching handle keeps you from searing your hand. Riveted wood handle won't crumble when things get too heated. All because MAN LAW® men know grilling is no joke!